Just days old and with no mother in sight, Astro, a Steller sea lion pup, was spotted by a researcher at Año Nuevo Island, rescued and admitted to the Center. 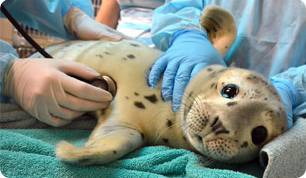 Astro was very young, so volunteers had to bottle-feed him a nutrient-rich formula made of ground fish, salmon oil, water and soy milk. Over time he was introduced to whole fish - an education process for our pup patients that we call ‘fish School.’ Astro graduated fish school with flying colors and after ten months of care at the Center, he was strong enough to go back to the ocean. However, despite everyone’s efforts, Astro had adapted to humans and had to be rescued again. After two releases – and two returns to human populated areas – Astro was given a new home at The Mystic Aquarium in Mystic, CT where he now happily resides. The western Pacific population of Steller sea lions has been listed as a threatened species since 1997. The Center helps many endangered and threatened species in order to help the greater populations thrive in the wild.